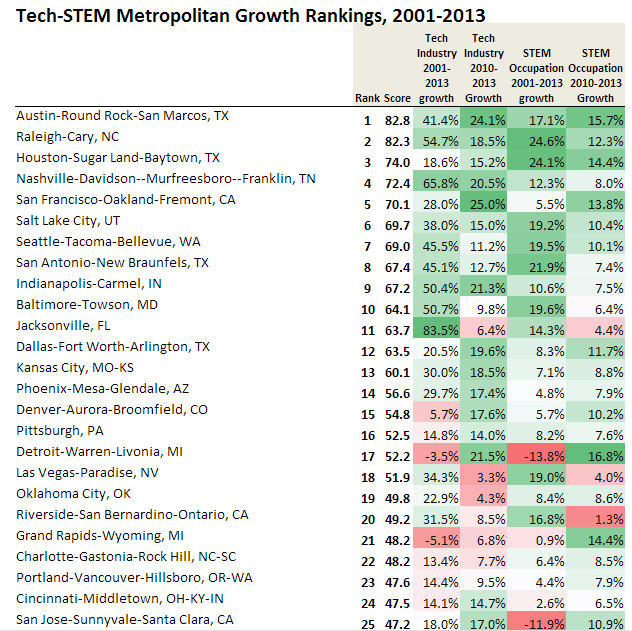 Silicon Valley, home to 40% of the nation’s venture capital, ranks only 25th in the nation for Tech-STEM growth between 2001-2013. To be fair, the valley took a good hit after the 2001 dot-com-bubble. To be even more fair, Silicon Valley does not include San Francisco, an hour north (SF ranks 5th). Despite the influx of capital and proliferation of startups, Silicon Valley lost 80,000 jobs in high-tech manufacturing. Remember HP? AMD? IBM? Philips? Sony? Sun? Xilinx? People often forget this, but Silicon Valley started when Caltech grads migrated north and laid their eggs in the form of Fairchild Semiconductor and Intel. Moral of the story: If you build hardware for a living, learn to code. Broader moral of the story: No tech skill stays relevant forever.